I've posted before about the great greeting card assortments for sale at Costco. 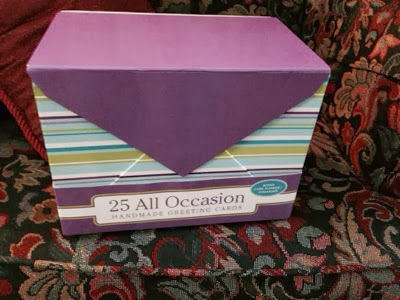 I particularly like the current 25 All Occasion assortment. The box contains 25 cards, at a cost of under $15.00 for the entire box. Since it usually costs me at least $2.50 for one greeting card at the card store, this is a wonderful price. And these cards are heavy, 3-D cards. The cards come with a warning that postage may be more due to weight. I don't mind an extra stamp given the quality of the cards. On the back of the box is a graphic, showing each card in the box; and, with the store display, Costco usually has a loose leaf notebook that shows each card. The children's birthday cards in this assortment are especially fun, but I like the adult cards also. I love opening a product and finding out it is even better than anticipated. This happens to me a lot at Costco. Aren't they great? My mother in law always says "you give me the nicest cards". I feel a little guilty (but not too much) that they cost less than a dollar! I love these, too! Every time I use one with a gift, the card gets all of the attention. Yet another reason to love Costco. I wish they had an assortment that was just for Valentine's Day. I would buy them and send them to my children and grandchildren.